So, how exactly should you deal with back chatting and will it ever end? 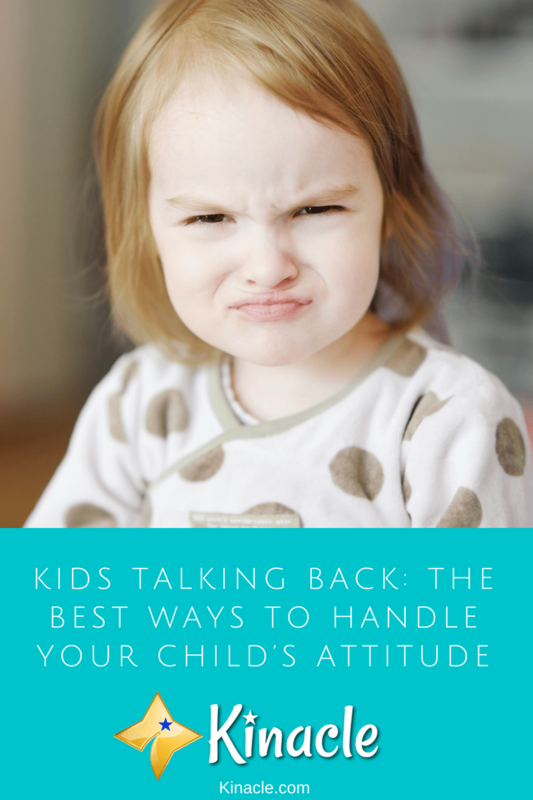 Here, you’ll discover some of the best ways to handle your child’s new bad attitude. It’s a good idea to think up suitable punishments ahead of time. That way, when your child does backchat you, you’ll know exactly how to handle it. The best type of punishment is to take away something your child enjoys. It could be watching their favorite TV show, heading over to a friend’s house, or even their smartphone or tablet. Taking away their privileges for a short period can prove really successful at tackling back chat. It may take a few times, but your child will learn that a bad attitude has consequences. When your child does talk back to you, make it clear that type of language isn’t acceptable. Then, tell them the consequence, such as you’re taking their tablet away for a few hours. This is more than likely going to be met with even more attitude. They may even tell you they hate you. They don’t, it’s just a common response that children have when they’re annoyed and frustrated at not getting their own way. It’s important not to respond to whatever attitude they give you. Don’t negotiate with them and don’t try to reason with your child or justify why you’re taking away their privileges. Simply do it without any further explanation. Equally as important, is not to punish them for further backchat which is resulting from having their privileges taken away. Treat it as a single incident instead. This is because when you continue to punish them, their anger and frustration is simply going to grow. They need time to calm down and that won’t happen if you’re continually taking things away. A key rule you absolutely need to follow is not to lose your cool. No matter how much you want to snap, take a deep breath and just remain as calm as possible. Your own anger and frustration will only add fuel to the fire. By remaining calm, you are showing your child how they should be behaving. Out of all of the tips on this list, this is by far the most difficult to stick with! However, if you manage it, you’ll find the situation resolves itself much quicker than it would if you were to get involved in a war of words. It’s easy to assume the backchat is simply an attitude problem, or your child trying to get a rise out of you. However, this isn’t always the case. It could simply be your child has overheard another child saying the same things. Or, they may have had a frustrating day at school and they’re back chatting because they feel irritable and tired. Identifying the triggers can often be the best way to start eliminating the behavior. Do you yourself use snarky comments or talk back to your partner in front of your child? If so, you’re going to want to stop! Remember, children learn from their parents. They look to you to be a good role model. So, if they witness you doing the same behavior, they’re naturally going to copy it. All too often, it’s easy to get so caught up in your child’s bad behavior, that you forget to recognize their good behavior. Don’t forget to praise their good behavior whenever they’re being polite. This will teach them the kind of talk that is not only acceptable but encouraged. More often than not, children want to be praised. When they back chat, they may continue the behavior purely because it gets them attention. If you fail to praise them when they’re polite, they’ll just continue giving you attitude because to them, negative attention is better than no attention. It’s really easy to take your child’s back chatting personally. However, what you need to understand is it’s actually a normal part of their development. It can occur at any age and while it will ultimately disappear, expect it to become an issue again further down the line (especially when they reach the dreaded teen stage!). All parents have to deal with back chat at some point. So, it’s absolutely nothing to do with you as a parent. Your child doesn’t just learn from you – they also learn from the things they watch and their peers. So, if their attitude has suddenly gotten worse, it’s worth looking at what they are exposed to. Could they have heard what they’re saying to you on a TV show? Or maybe they’ve started hanging out with new friends and they could have picked it up from them? Identifying whether there are any outside influences playing a part in the behavior is important if you want to put a stop to it. Although back chatting is a normal part of every child’s development, sometimes it can go too far. If nothing appears to be working and the situation is only getting worse, it could be worth taking them to a child psychologist. This may sound extreme, but it would be highly beneficial if your child’s behavior is out of control. So, there you have it, some of the best ways to handle back chat. It’s not easy keeping your cool and waiting it out, but this phase will pass. If it doesn’t, there’s always professional help out there. Start following the tips above and if there’s still no improvement, book your child in with a specialist to see if there’s a deeper issue causing the problem.